At McLoone's Restaurants the art of philanthropy starts from the top and trickles down. It is simply a part of our culture. In 1993, Mcloone's Restaurant owner Tim McLoone founded Holiday Express, a non-profit, non-sectarian organization dedicated to bringing music, gifts, and holiday cheer to those less fortunate. 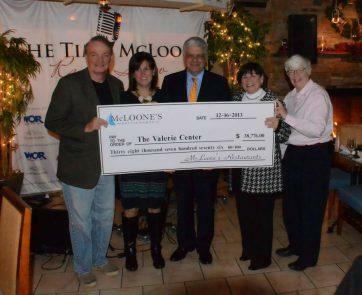 McLoone's Restaurants and their employees have dedicated their time and talents to this organization. Each year all of our locations choose a Holiday Express client whether it be a soup kitchen, developmental center, psychiatric hospital, homeless shelter or any of the other people in need that Holiday Express visits. Our staff collects donations on their behalf, grants them a wish off their wish list and volunteers their time on the day of the event. In addition, our restaurant chefs prepare food to feed the clients at several events throughout the season. The food is transported to the location and employees from our restaurant are on hand to serve. It is a combined effort that our employees look forward to every year. McLoone's Restaurants also regularly supports local organizations and charities within the communities they serve. One way in which this is accomplished is through their "Dine to Donate" program. The program is offered to both local and national charities as a way to raise money for their organization. A mutually agreed upon date and restaurant is selected and the charity then invites their members and supporters to dine at the McLoone's restaurant of choice. On the evening selected the diners present their invitation to show their affiliation to the organization and a percentage of the sales from their meal will be donated back to their charity. Many of our employees serve on committees and participate in fund raising events for various non-profits. We encourage their coworkers to support them by sending out an internal email blast called "Help us to help others." The email highlights the opportunities in which others can help that employee in their fund raising efforts. We are proud of the "pay it forward" attitude that is part of our everyday lives at McLoone's Restaurants. On Thanksgiving Eve 1993, as restaurateur and musician Tim McLoone prepared for yet another holiday surrounded by loving family and friends, he felt a strong sense of gratitude... but also a nagging sense that he should do something to bring this warmth to others less fortunate. He turned to his network of musician friends with the idea of bringing the healing power of music to people whose lives needed an injection of happiness. By that December, his small band of troubadours and other volunteers put on parties for AIDS patients, the developmentally disabled, the isolated elderly and disadvantaged children. At the end of the first season, Tim's makeshift group of merry-makers performed for more than 6,000 people in 10 different venues. After the tinsel and jingle bells were put into storage, Tim and his friends could not easily put aside the emotions brought on by seeing so many people in such difficult circumstances. The group knew that they had to keep the momentum going. They dubbed themselves Holiday Express, and, in 1994, received approval to operate as a non-profit, non-sectarian organization. Every year, Holiday Express has grown in reputation, in volunteer members and in reach. The band currently boasts more than 70 singers and musicians from noted bands and the Broadway stage. Our general volunteers offer countless ideas, skills and talents. The group visits more than 50 institutions every year between November and the end of December, bringing its unique brand of music, food, presents and pure joy to people who need the gift of human kindness. The handful of volunteers who helped host the first parties in 1993 has since mushroomed to more than 90 dedicated musicians and 1200 general volunteers who help keep the organization running like a well-oiled wheel, with just four steadfast employees who handle day-to-day operations. Indeed, Holiday Express has an indefinable something that makes a meaningful difference in the lives of thousands of area residents. This magical aura is reflected in the hugs and smiles of our many clients. No holiday glitter shines brighter! Learn more about Holiday Express at www.holidayexpress.org. Jersey Shore Univ. Medical Ctr.